Striped Bladderwort is a small insectivorous herb, 5-10 cm tall, growing on wet rocks and tree trunks. Filament-like stems are creeping. Leaves appear in small rosettes at the base, 3 mm, circular, with leaf-stalk 3-5 mm. 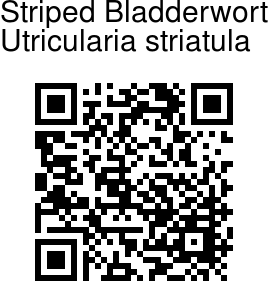 Creeping stems have bladders attached. Flowers appear on erect filament-like scapes, 3-10 cm long. Scale-like bracts are attached on the scape. Flowers are 2-lipped. Lower lip is almost circular, 5-lobed, with a violet and a white stripe. Base of the lip has a yellow spot. Spur is 5 mm long. 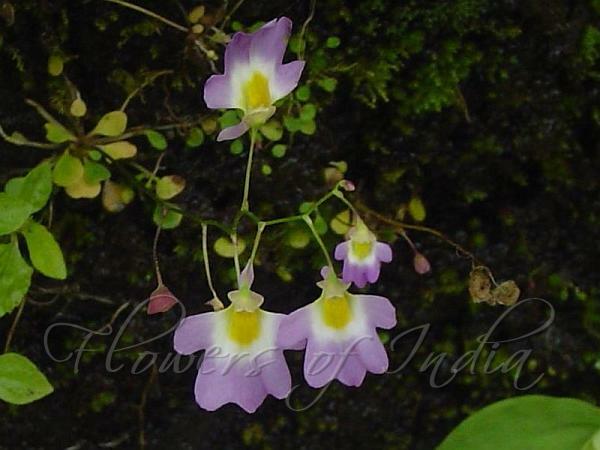 It is occasionally found on vertical wet rock faces on the hills and slopes of Western Ghats. It is also found in Eastern Himalayas, at altitudes of 400-3600 m. Flowering: June-September. Identification credit: Rahul Prabhu Khanolkar, Prashant Awale Photographed at Lohagad Fort, Lonavala, Maharashtra.